A subtle sweetheart back adds appeal to this contemporary sofa that lets you become a gracious host to out-of-town guests. The curvy silhouette continues below the large rolled arms where the base of sofa curves out like a bombe chest for a romantic flair. This pretty sleeper sofa adds a comfortable and stylish focal point for relaxing and entertaining in your living room. The queen-size premium innerspring mattress makes sure that guest's get a good night's rest with this functional sleeper sofa that creates a guest bedroom instantly and only when you need it. Regular Sleeper and 3/4 Sleeper sofas also available. The 2700 Queen Sleeper Sofa with Rolled Arms by Lancer at Belpre Furniture in the Belpre and Parkersburg, Mid Ohio Valley area area. Product availability may vary. Contact us for the most current availability on this product. Fabric Options Many fabric options are available by custom special order. Arm Rolled arms with sides that curve out for contemporary style. The 2700 series offers a unique sofa group with elegant design details. The contemporary style resonates with the large rolled arms, curved sides, and arched back cushions. 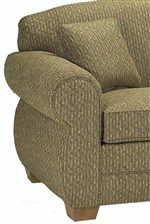 Pleated fabric at the arms and cushion corners along with welt cord trim and tapered wood feet finish the appealing look. Customize the sofa for your living room with the variety of fabric choice's available by special order. Complete your room with the coordinating items (not shown): chair, loveseat, ottoman, Regular Sleeper, and 3/4 Sleeper. The 2700 collection is a great option if you are looking for Contemporary furniture in the Belpre and Parkersburg, Mid Ohio Valley area area. Browse other items in the 2700 collection from Belpre Furniture in the Belpre and Parkersburg, Mid Ohio Valley area area.